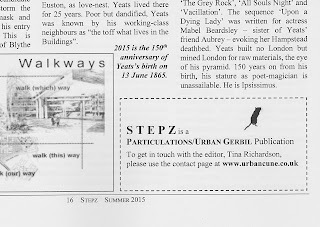 S T E P Z is a zine for and by those interested in psychogeography and in critiquing, appreciating and debating urban space. It does not have the strict editorial rules applied to it that would be the case in an academic article, textbook, or even in a novel. 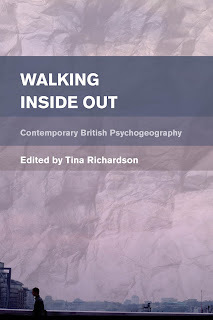 It is, what you might call, ‘editorially restrained’ and is the brainchild of the psychogeographer Tina Richardson. This pilot edition includes contributions from both professional and creative writers. Please click here for a welcome from the editor and for a list of contributions. S T E P Z is available to download online for free and for sale in limited edition hard copy format. The limited edition hard copy differs slightly from the downloaded free version due to the insertion of a symbol to denote its limited edition status (see above) and to differentiate from possible bootlegged copies. The hard copy is 16 sides of A4 bound into a booklet and costs £4.00 plus postage. Please click here to download a free pdf. Please get in touch via the contact page at www.schizocartography.org to organise a limited edition hard copy. You can pay via cheque or paypal. In May I was kindly invited by Christine Bairstow to a memorial event in the cemetery at the University of Leeds, St George’s Field. 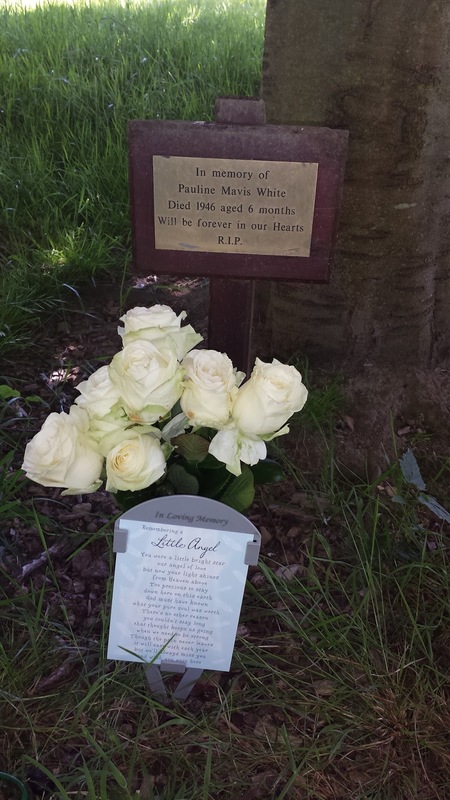 Every year Christine visits the cemetery on the campus where her sister, Pauline Mavis White, is buried. Pauline is Christine’s twin sister and died on the 10th of June 1946, when they were 6 months old, after a serious illness that they both suffered. 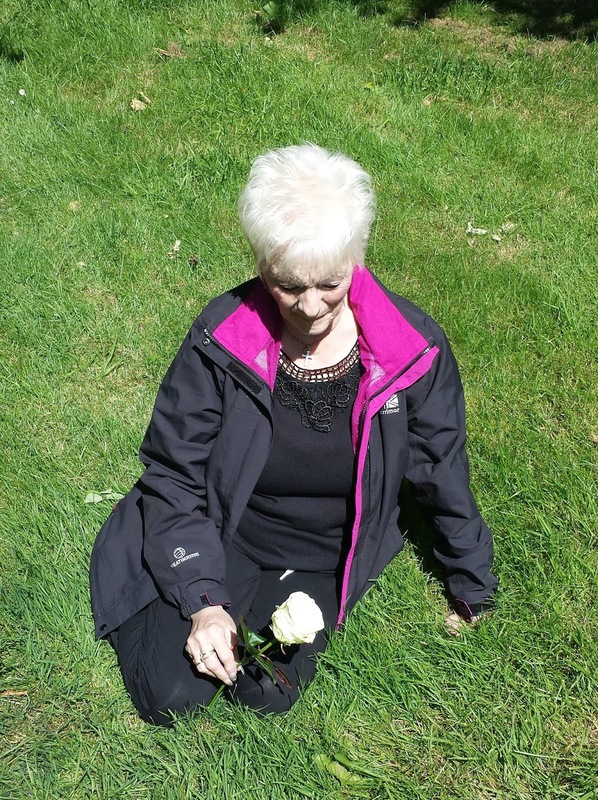 This blog is to say thank you to Christine for generously asking me to share her very special afternoon. The images and text will be interspersed with relevant text from my doctoral thesis, which is actually how Christine found me to start with. In summary, the University of Leeds acquired the cemetery during the major (Chamberlin, Powell and Bon) 1960s redevelopment period on campus. At this time Woodhouse Cemetery was in a state of disrepair. 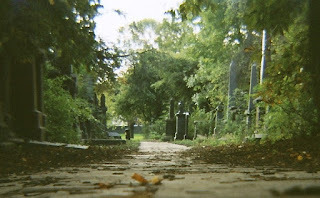 Initially the university had hoped to be able to maintain the cemetery as it was, but on further examination this turned out to be too expensive and they got an Act of Parliament in 1965 to enable them to purchase the shares for the plots and then turn the cemetery into a landscaped park. This led to the setting up of the Woodhouse Cemetery Defence Organisation to protect the cemetery, but the university won the battle in the end. The gravestones were removed, although the bodies still remain. Wednesday 10th June 2015 was a beautiful sunny day and I caught site of Christine in the distance walking towards the space under a tree where the plaque is located. I recognised her from her facebook profile image. She was carrying flowers. Christine told me about her sister and parents and about her own childhood. She explained that the university had a planted a tree for the family a little way away from the actual unmarked plot. She showed me the approximate place where Pauline is buried and she sat there and I took the photo above. Thank you, Christine, for inviting me along to your memorial day, I was extremely touched to be part of it and it was really lovely to meet you. When is a Ley Line not a Ley Line? …When it is a Perambulatory Hinge! The theory of ley lines are attributed to the British author Alfred Watkins (1855-1935). He first referred to them The Old Straight Track (1925). Ley lines are straight lines that connect culturally historic places of esoteric interest that are woven into the landscape. However, they are often considered to be more theoretical than material. Ley lines then had a following in the Countryside Discovery Movement. And following the publication of The View Over Atlantis (1969) by John Michell there was a 1970s resurgence through the Earth Mysteries School, which focused on seeing ley lines as ancient paths that connected monuments and places of spiritual importance, for example in paganism. Interest was in the hidden energies between significant points. During this phase a magazine on the subject was spawned, The Ley Hunter. In contemporary times, the deep topographer Nick Papadimitriou is interested in them as part of his work in “answering the call of the county” (Papadimitriou 2009). That county being the geographical region of Middlesex. A study of leys taught me that the current general idea of what ley lines are is pretty off base. But in researching the phenomenon, some truly intriguing earth energy mysteries can be found. There are fairy paths, corpse roads, geister wegen, and a slew of other supernatural linear features on our planet where people do come for spiritual experiences, and there are ‘roads’ that ghosts have been reported traveling down repeatedly (Belanger 2003). Ley lines certainly started researchers like Devereux down the road of investigating true spirit paths and other earth energies, and for that, we’re indebted to Alfred Watkins. But the term ‘ley line’ is not specific enough to describe any peculiar linear or energy feature on our planet. There are many earth mysteries that we need to continue to explore with our open minds (ibid.). However, I am not writing an article on what ley lines are, exactly, but on something that might be considered to be akin to the postmodern equivalent of a ley line…sort of: perambulatory hinges. Perambulatory hinges are generally attributed to postmodern space (2). Or should I say, they are predominantly a postmodern event, occurrence or manifestation. The reason for this is that, unlike ley lines, they are not formed at places that are considered to be sacred in their day or have any religious significance (3). Secondly, they are actually produced through their effects: they come into existence as a particular reflexive response. This reflexive feature is largely a postmodern theme. It is also important to note that perambulatory hinges are not lines at all. They are more like points or axis and are formed through the effects of a turning on the spot carried out by an observer in the articulation of a gaze. However, they cannot be made through the effects of a single ‘turn on the spot’, but build up cumulatively over time. ‘Turning’ and ‘calling’ are two key components of the hinge (4). Here’s an analogy. You may be walking to work or shopping in the High Street when an advert calls to you: it appears to be calling to you – ‘you’ are its ‘audience’. If you remember the advertising scene from Minority Report (Steven Spielberg 2002) when we see the personalised adverts aimed at Captain John Anderton (Tom Cruise), it is rather like that. But instead the urban phenomenon has no inherent intention built into it like the personalised adverts do in Minority Report (so it is not ideological in that sense). Instead what happens is that you, the individual, overwrite a personalised aspect onto the object in question. You spot something, you make some personal connection to it, and you turn to look at it. A good example of this ‘personal’ part of a perambulatory hinge is given to us by the theorist of how ‘myth’ works, the cultural semiologist Roland Barthes. Barthes gives us a perfect psychogeographical example in ‘Myth Today’. He provides an instance of being out on a walk in Paris when he comes across a house with a specific architectural design that has meaning to him. This house is of a specific Spanish style and is out of place in its French context. Barthes says: “I feel as if I were personally receiving an imperious injunction to name this object a Basque chalet…it comes and seeks me out in order to oblige me to acknowledge the body of intentions which have motivated it and arranged it there as the signal of an individual history” (2000: 125). For Barthes “it is a real call, which the owners of the chalet send out to me” (ibid.). This idea of ‘calling’ is important to how the perambulatory hinge works (as you can see by Barthes’ example, it is personal yet also cultural). It is also this concept of ‘calling’ that connects the work of Barthes to the neo-Marxist Louis Althusser in regard to ideology (and it is also what the perambulatory hinge hinges upon, literally). In Althusser’s and Barthes’ work this calling is the process of subjecting. The urban object actually subjects you, it interpellates you (in the hinge it interpellates you materially to the actual ‘spot’ in space, the potential hinge). It recruits you through its effects. The perambulatory hinge may not recruit you in the absolutely ideological way expressed by Althusser. But nevertheless it is through a cultural effect that it acts upon you, so in that sense it can still be argued to be ideological. One of the points Barthes makes in regards to the myth is worth mentioning here in regards to the hinge. He says that the myth operates such that “at the moment of reaching me, it suspends itself, turns away and assumes the look of generality: it stiffens, it makes itself look neutral and innocent” (2000: 125). In ‘Ideology and Ideological State Apparatuses’, Althusser provides us with the example of a policeman in the street shouting out a general ‘hey you’ to a specific person, but we think he is calling to us (even if we haven’t committed a crime) and we turn in response to the call (2006:118). So, like the policeman in Althusser’s example, the urban décor hails us – well it hails everyone, but we feel it is hailing us, specifically – and we, sort of, do this 180 degree turn that Althusser says occurs at the point of subjection (ibid.). Consequently, we recognise the calling of the phenomenon in its personalised hailing of us. The object, in its expression which is directed at us, appears in its obviousness. It really is calling us. The effects of the response to the calling retroactively produces its cause through subjecting the individual. Therefore, the individual who is responding to the urban phenomenon, as the subject, is both the cause and effect. This is the effect of the urban apparatus of which the individual is subjected, but it is also what produces her/him as the psychogeographer in that moment, as the cause of the effects at that point in space. Here are two examples, one which is likely not to be a perambulatory hinge and one where one might be developing. 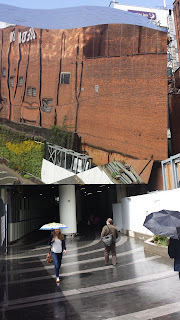 In May 2015, I was kindly invited to Birmingham by the local artist Ally Standing for a psychogeographical exploration of the city. We took a short trip on the train out to Spaghetti Junction and explored the space under Birmingham’s internationally famously complex road system. At one point, Ally pointed out the above pillar to me because it had ‘zine’ written on it. 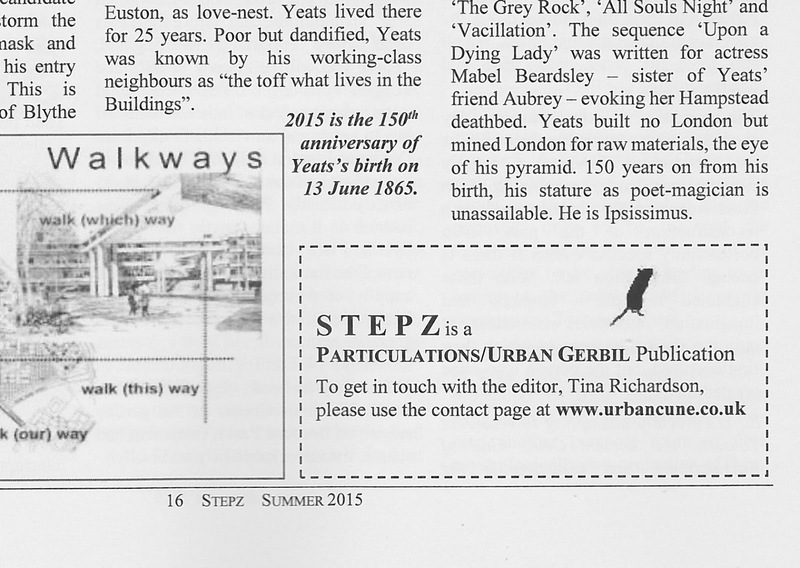 At this time I was editing a psychogeography zine (S T E P Z), and she was also contributing to it. So she turned towards the pillar, followed shortly after by myself making the same turn. In an Althusserian sense it was as if it was us who were “meant by the hailing” (2006: 118). However, I think this spot would be a tenuous place for a hinge to develop due to the rarity of this particular recognition. And it is the multiple recognitions of the call that is the key. Not many people entering this space will have a connection to the word ‘zine’. 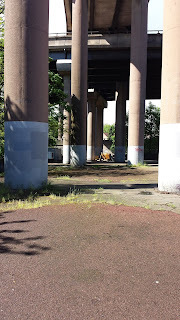 However, I am not saying that there might not be other hinges under development under Spaghetti Junction that I am unaware of. So, let’s look at a possibly better example in Birmingham. At the New Street Development near the train station is the above section of the new station entrance. This contemporary structure has one of the classic motifs of postmodern architecture, a mirror-effect that reflects the surrounding environment of the space around it: what the architectural scholar Reinhold Martin describes as “feedback loops…a doubling back of the surface onto itself” (2010: 106). This building is ‘uncanny’ in the Freudian sense of the word: unheimlich. Sigmund Freud takes the word from the German unheimlich which means the opposite of what one might find familiar (heimlich meaning familiar, in other words homely: but be careful here, because for Freud the two terms become conflated into what he means by ‘uncanny’). So, the uncanny has the qualities of both the familiar and the unfamiliar at the same time. I would describe the building as producing a strange kind of affective dissonance in its uncanniness, which is very disturbing. It throws you into this spaceless space in between binary oppositions (recognisable/unrecognisable, understandable/incomprehensible). Reinhold says these binaries are an inherent part of the feedback loop. Also, in regards to both mirroring and the uncanny, often the thing recognised is known but is out of place. Decontextualisation can create the feeling of the uncanny. The image creates a doubling and the reflection of the nearby Redbrick building is both familiar and unfamiliar, hence uncanny. You recognise it to be a Redbrick, but it appears to be sitting atop a single pillar that couldn’t possibly support it. I believe it is possible that this uncanny effect could, over time, produce a perambulatory hinge in this area. If you are fortunate enough you could be present at the making of a perambulatory hinge. You may be the person on the spot at Birmingham New Street when critical mass is reached, and that hinge comes into being for the first time. And if, as the famous and mythical Richard Essex of the London Psychogeographical Association says, “All ley lines emanate from Porlock”, I wonder where the ‘spiritual’ home of the perambulatory hinge might be? 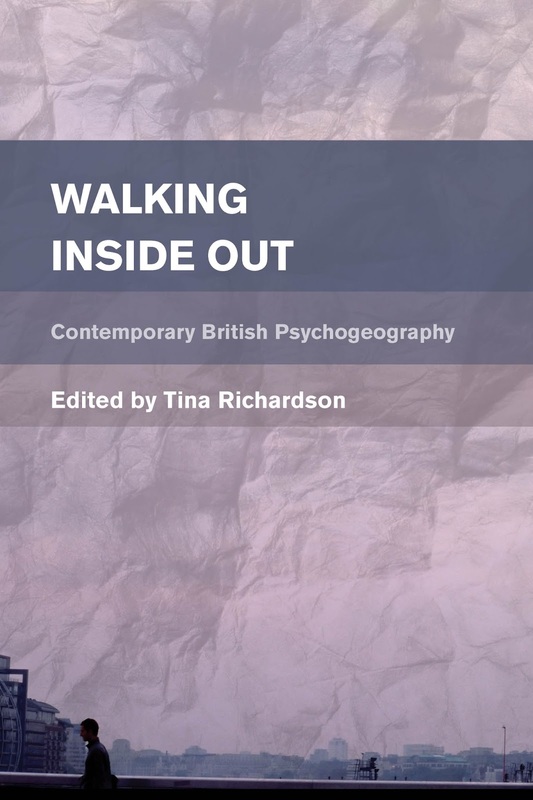 (1) Psychogeographers are urban (generally) walkers who practice a critical form of walking which investigates particular aspects of the landscape that hold interest to them. 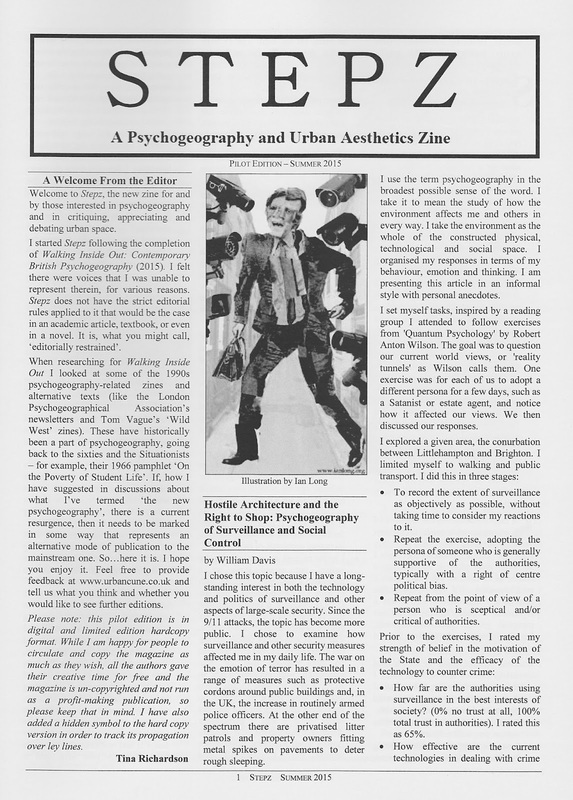 The term ‘psychogeography’ is rather vague and can refer to anything from analysing the social history of a place to critiquing the prevalence of neoliberal policy as it appears in our towns and cities. Psychogeographers are interested in the aesthetics of space and how it affects the psyche. (2) Perambulatory hinges are not absolutely a postmodern phenomenon; however, the palimpsest aspect of postmodern space also makes for it to be more likely to occur in postmodernity. (3) We now live in a secular society and also the position of the State as being the centre of cultural identity has now been largely displaced in postmodernity. (4) G. Spencer Brown’s Laws of Form (1969) may of interest to those of you who are mathematically inclined in regard to ‘calling’. (5) I would point those interested in ‘lines of sight’ to Michel Foucault’s ‘Las Meninas’. Tina Richardson will be talking about how a critical form of walking in our towns and cities can transform our relationship with them. 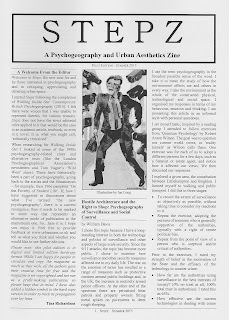 Psychogeography can be used by anyone as a tool to explore urban space and reveal a sense of place in the built environment. Reading from her new edited volume – Walking Inside Out: Contemporary British Psychogeography – Tina will look at ways we can see beyond the homogenised world of urban planning to a multiplicity of radical new experiences and hidden worlds in our everyday spaces. Tina is an independent scholar and psychogeographer. 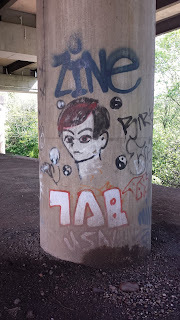 She became interested in psychogeography in 2009 when researching the Situationist International and set up Leeds Psychogeography Group that year, running it at the university till 2013. She is now a writer/editor and guest lecturer. Tina is currently editing a magazine called S T E P Z, which will be published in June. Walking Inside Out will be released in July. Tina’s talk will be part of the 'Unofficial Britain' section of Influx Press’ 'Alternative Voices' event which begins at 1.00 in The White Hart. Please click here for full details of the afternoon.